Yesterday I wrote about the growth in Android vs. iOS. The two platforms’ can be said to be enjoying healthy growth, though in markedly different patterns. 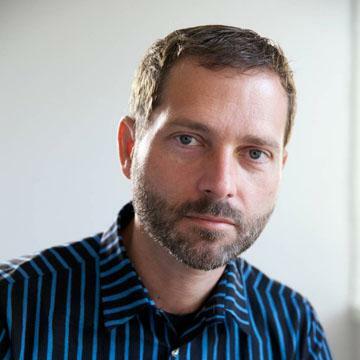 The consequences of this growth are being felt across the telecom and computing industries. There are almost 300 million platform devices in use today that were not even dreamed of three years ago. Operators are transporting petabytes more data and dozens of phone vendors are scrambling to meet demand. There are tens of billions of app downloads and hundreds of thousands of apps being sold by tens of thousands of new app publishers. There is a lot of hay being made while the sun shines. But what about the poor saps that are funding the development? What about the shareholders of the companies behind these platforms. Are they being rewarded or punished? I took the platform growth data published yesterday and overlaid it on the share price data (source: Google finance). Each plot begins at the point in time when the respective platform was available in the market and ends today. There are two vertical axes: the left side axis shows “activations” or units sold and corresponds to the thick blue line; the right side axis shows share price and corresponds to the area chart. Overall date range and growth in share price is shown in the upper left corner. What can we interpret from this superimposition? 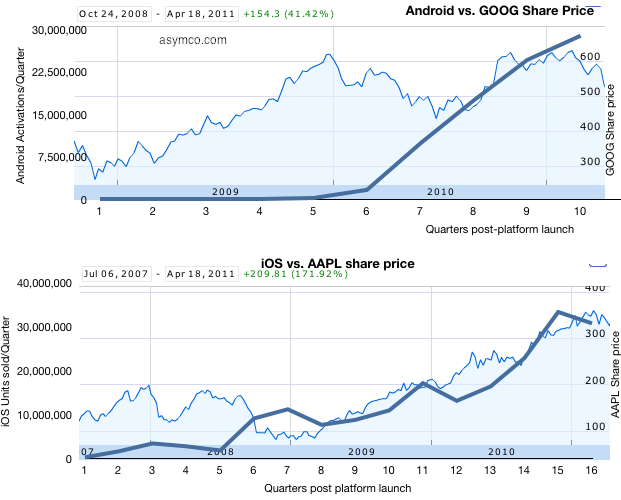 Apple’s share price appreciation seems highly correlated to iOS growth but Google’s doesn’t. Google share price had dramatic growth during 2009 while Android was moribund and was flat to down during 2010 when Android growth was explosive. We can also interpret the difference as Google’s fortunes being far less dependent on mobile platforms than Apple’s. Google has been subject to selling pressure this year due to corroding cost structures irrespective to platforms growth. Conversely, Google may not benefit from mobile computing as handsomely as Apple. Correlation is not causation and clearly there are many factors at work in share price changes but I think it’s fair to say that Apple is obtaining fuel for growth with iOS while Google is in a more precarious situation with mobility–partly benefiting but partly threatened. The market behaves in bizarre ways in the short term but in the long term one can see logic and reason.